For my mum's Children's Book Tea Party (see my last post for the rest of the goodies!) I decided I wanted to make a bigger cake to go into the middle, surrounded by all the bite-size other pieces. I made a makeshift stand for it out of a few teacups, a saucer and some blue-tack. 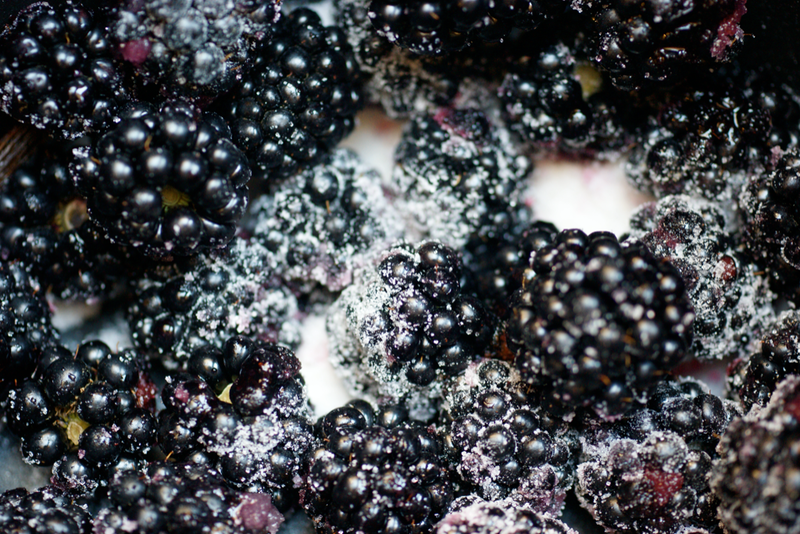 I had a few punnets of blackberries from the market and decided that these could be the main theme to my cake. 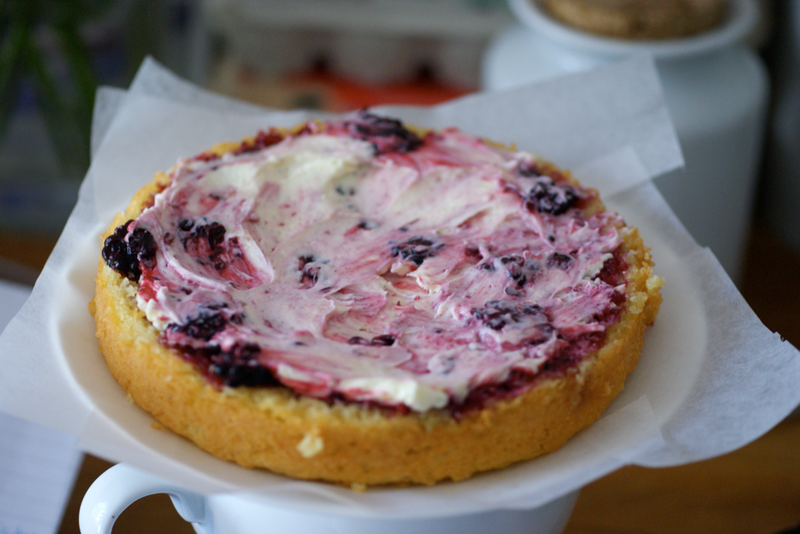 I decided to use the wonderful recipe for vanilla cake that I had used for my mum's Blueberry and Ginger birthday cake. Vanilla seemed like the perfect subtle pairing with the blackberries. I decided to use a similar premise to mum's birthday cake - lovely sponge, moistened with sugar syrup, layered with fruit compote, iced with a creamy icing and topped with fresh fruit. I added some icing to the layers to give it height and body - next time I think I'll beat some blackberry into that icing as well as spooning it over the cake first to give it more of a blackberry hit. When I was making the cake batter, I managed to screw it up. It curdled badly - I wasn't concentrating and added too much egg too quickly. It still looked curdled when I poured it into the tin. As it has such a long baking time and I was on a schedule, I was pretty worried. Yet when I took it out of the oven, it was perfectly golden and incredibly flat topped - I didn't in any way have to trim this cake. When I split it open, I was greeted with gorgeous golden sponge. That's why this recipe is such a keeper - it seems to turn out great results whatever you do to it. 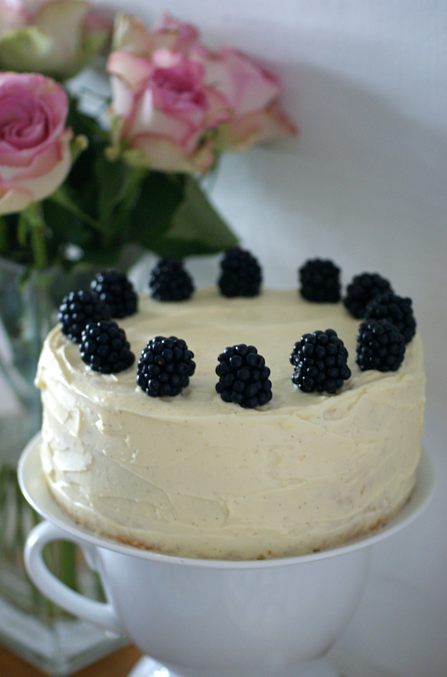 Together with the icing and blackberries, it made for a delicious cake. Preheat the oven to 160C/140C for fan ovens. Grease and fully line a 6" round tin. Put the butter and sugar in a mixer and cream till pale and fluffy. Add eggs one at a time, beating well between each addition. You may need to add a tbsp or two of flour to stop it getting slimy. Beat in the yogurt. Sift the flours over the batter and fold in - when nearly done, add the milk and vanilla. Spoon into a tin and bake for about 1 hour - 1 hr 15 or until risen, golden and a skewer comes out clean. Leave to cool on a wire rack for 15 minutes before spiking the cake all over and pouring some syrup over, letting it sink in as evenly as possible. Leave to cool completely before removing from the tin. *see the guide to my recipes on the sidebar for my method for halving eggs. Put everything in a small pan and heat until the sugar is dissolved. Transfer to a small pot and leave to infuse. Slowly beat the softened butter into the icng sugar. Scrape the cream cheese and marscapone into the bowl and beat in. Add the vanilla and beat again. Put into the fridge to chill for half an hour or so before freezing. Does keep at least overnight in the fridge before using. Scrape the vanilla pod and put both seeds and pod into a small pan. Add all the other ingredients. Heat gently until the fruit is soft - mine turned a brighter red. Squish the fruit a bit. Leave to cool and then put in a jar in the fridge. Keeps for about a week in the fridge. 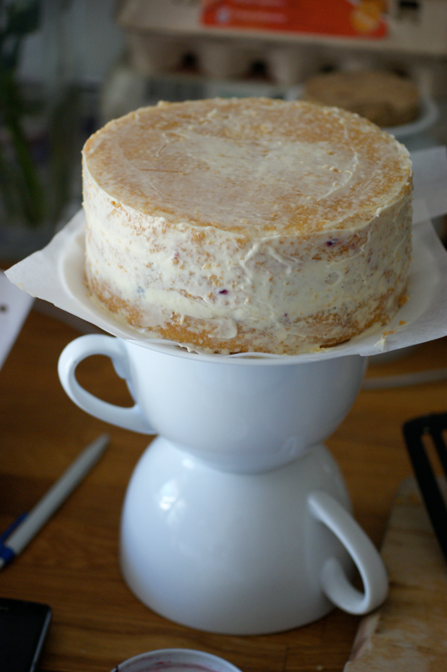 Split the cooled cake into three layers using a serrated knife or cake leveller. Place four strips of parchment paper on your serving plate and put one of the layers on the bottom. Spoon blackberry compote over the layer, making sure it is all covered well. Add a few tablespoons of icing and swirl in. Add the next cake layer and repeat. 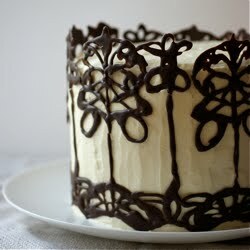 Add the final cake layer and use some more icing to make a crumb coat. Leave in the fridge for 30 minutes to set. 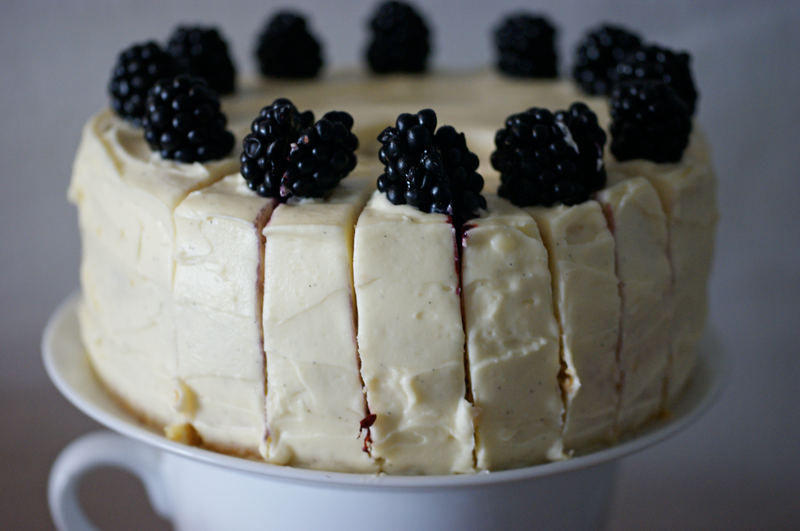 Finally make an even coating of the icing and arrange some more fresh blackberries on top. Hi this looks amazing! I was wondering if I could split the cake batter into separate pans instead of cutting them into 3 different layers?